Q6-BAT for Mitsubishi MELSEC controllers. Q6-BAT for Mitsubishi MELSEC Q Series controllers. Type: Lithium. 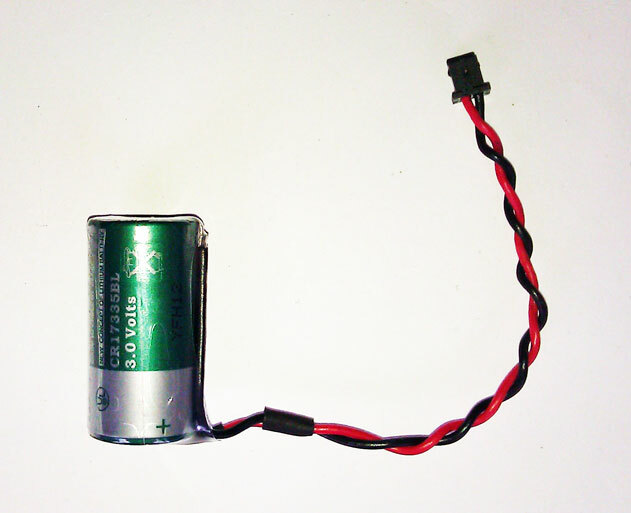 Voltage: 3.0 V.
Height: 36 mm. Diameter: 17 mm. Price: £17.33. Postage and packing included. Replaces: Battery Q6-BAT for MITSUBISHI MELSEC PLC controllers. This Q6-BAT Lithium PLC controller battery fits several MITSUBISHI MELSEC PLC controllers. It is a DIRECT replacement for the Q6-BAT battery. For MITSUBISHI MELSEC Q Controllers - Q02CPU, Q02HCPU, Q06HCPU, Q12HCPU, Q12PHCPU, Q12PRHCPU, Q25HCPU, Q25PHCPU, Q25PRHCPU, Q170HBATC, Q172HCPU, Q173HCPU, MELSEC Q Series. Replacement for the Q6-BAT, 130376, BKO-C10811H03, 624-1831 battery. This Mitsubishi Q6-BAT PLC battery comes with a one year manufacturer's warranty.